"Every social space is the outcome of a process with many aspects and many contributing currents, signifying and non-signifying, perceived and directly experienced, practical and theoretical. In short, every social space has a history. (...) history must account for both representational spaces and representations of space, but above all for their interrelationships and their links with social practice. (...) things could not be created independently of each other in space without taking into account their interrelationships and their relationship to the whole." The picture above has been taken in Paris one month ago, I though it could illustrate Lefebvre: the notion of space as a production and the idea of history. On the picture, one could see different layers: - the physical environment in the form of pavement, that adopts a certain infrastructure driven by how things work in certain countries and culture. In this case, it is very french as attested by the type of concrete and stone used. - a regulation layer in yellow which depicts where people must not park - and some expression of people's creativity as shown this pink trace. 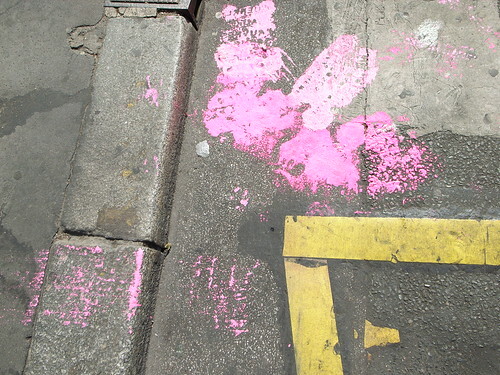 It's actually a new new graffiti trick that consists in throwing paint on the ground.